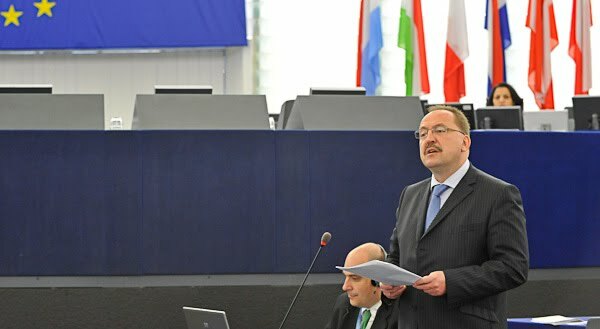 Last Wednesday (6th of April), Zsolt Németh, Minister of State for Foreign Affairs has replaced High Representative Ashton in the European Parliament’s debate on Bahrain, Syria and Yemen (see the EbS recording here and the EP recording here – please note that these are not official versions). 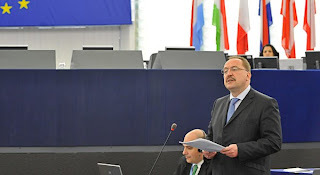 As all EU geeks know, at political discussions (vis-à-vis third countries or the European Parliament) the High Representative can only be replaced by other politicians, which means someone from the presidency. Considering the heavy agenda of the High Representative lately, Hungarian politicians spend considerable time standing in for her. This was one of those events. Our minister of state spoke in English and all went fine and smooth, a very measured language on the situation in Syria, Yemen, Bahrain. Then the members of parliament spoke and asked several questions. At the end of the debate, our minister of state rose again to react to the issues raised. Being a Hungarian politician, he switched into Hungarian this time. This is when the story became interesting. (If you are watching the recording on EbS, watch from the 57th minute.) In the humble translation of Kovács and Kováts, our minister of state said: “But I think, that these countries cannot be put in the same basket: there are countries where military intervention was unavoidable due to the civil war [meaning Libya and Ivory Coast], and there are countries that we are discussing about now [meaning Yemen, Syria, Bahrain]. *” He made a very clear distinction between the countries being the subject of the debate on the one hand and Libya and Ivory Coast on the other hand. However the English interpretation started to wonder into a surprising direction by translating his words as follows: “But we should not throw all of these countries into the same boat. I think, because of the civil war intervention had to take place.” People listening to the debate in English must have been very confused, about who wants to intervene where. The watchful Andrew Rettman of EUObserver, was listening to the debate in English and picked up what seemed to be a story. (It is not his fault that he does not speak Hungarian, so he could not realize that he was quoting the interpreter, but not the minister!) We have received a few questions on the issue and our diplomats have put out a few fires by explaining what was said in reality.We like to think that it was only our quick reaction that avoided a bigger diplomatic crisis. *HU original: De azt gondolom, hogy nem keverhetőek össze ezek az országok, ahol elkerülhetetlenné vált a polgárháborús helyzet miatt a katonai beavatkozás, azokkal az országokkal, amelyekről most tárgyalunk. ** HU original: Noha, ezek a represszív országok, ezek az autoriter, represszív országok, ezek táncolnak és játszanak az erőszak alkalmazásával is.